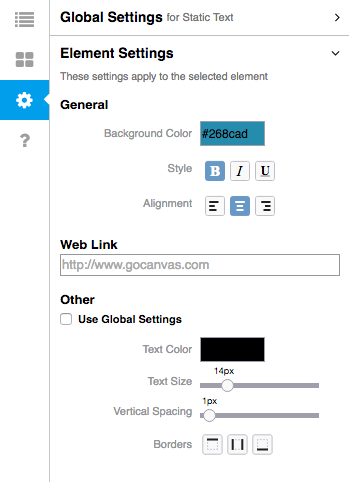 With the GoCanvas PDF Designer, you can include static text, images, and social link that do not appear in your App. Do you have a Terms and Agreement page that needs to be included on every form? Do you want to show images of your products in the form sent to your customers? This is the solution. To launch the PDF Designer, go to your Apps page and click the Edit PDF icon next to the App you want to change. 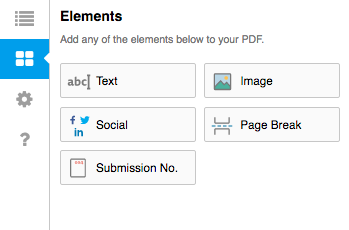 In the PDF Designer, click the middle Elements icon on the left panel. When clicked, you will see five options to add static text, images, social media icons, page breaks, and submission numbering. To add one of these elements, click and hold the icon from the Elements tab and drag it into a section or column in your design. You can learn more about sections and columns here. When you add static text to your design, you can click the Gear icon to customize font and other text properties. For more information on customizing text, click here. 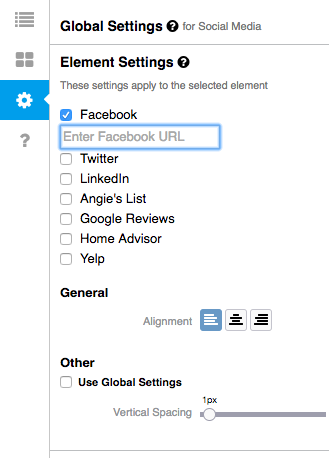 Adding an image element to your design will automatically launch the Settings tab to allow you to upload an image. The Social icon allows you to embed links to your Facebook, Twitter, LinkedIn, Angie's List, Google reviews, Home Adviser, and Yelp accounts. When the Social icon is dragged into your design, the Social settings will automatically appear in the Settings tab. To add a link to your social media account, click the check box next to the corresponding channel. A text box will appear where you can enter the link to your account. You can also adjust the alignment and spacing of these icons using the properties. GoCanvas tip: If you place a social icon in the header or footer section of your design, the embedded icons will appear on each page of your PDF output.